Of all the fresh hop beers that will be hitting taps throughout this hop season, we doubt you'll find one much fresher than this. Hop Nation clearly decided to live up to their name, not only choosing to brew another IPA but to get the hops from the farm and into the beer as fast as humanly possible (well, short of some sort of air travel). 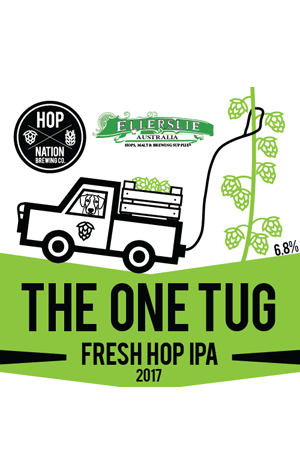 They headed to Ellerslie Hop in the Victorian High Country, pulled down enough bines – using "the one tug" for each – to be able to handpick 60kg of hop flowers, packed them into their ute and headed straight back to Footscray. There all 60kg was added to a lean, stripped back malt base (presumably something similar to what's arguably their best beer to date, The Chop) and from March 3 at the brewery, then at the Melbourne BeerFest, it will be pouring for hop fiends' pleasure. The beer, unfined and unfiltered, has, they reckon "a super fresh profile with green apple and grassy notes." There will be a launch event for it at The Terminus on March 10, which is hosting a mini-tap showcase throughout the long weekend. And you can watch a video of the boys' day at the hop farm here.